Come and Experience Kauai's Sunny South Shore & Beautiful Beaches. Towering Eucalyptus Trees form the Famous Arch known as the " Tunnel of Trees " as it Welcomes our Visitors and Marks the Official Entrance into Koloa & Poipu. Go Back in Time with a Stroll through the Streets of Koloa's Quaint Old Town and learn about the Historic Days of The Sugar Plantations here on the Island. Just down a bit on Lawai Road, you will Witness the Power of Kauai's Own Natural Geyser, " The Spouting Horn". The National Tropical Botanical Gardens is dedicated to the Preservation and Education of Tropical Plants and Offers Tours that will Inspire all Ages with it's Beauty and Rich History. It's also Home to The Giant Fig Trees filmed in the movie Jurassic Park. White Sandy Beaches Wrap the Coastline along Poipu for all your Fun in the Sun Activities. 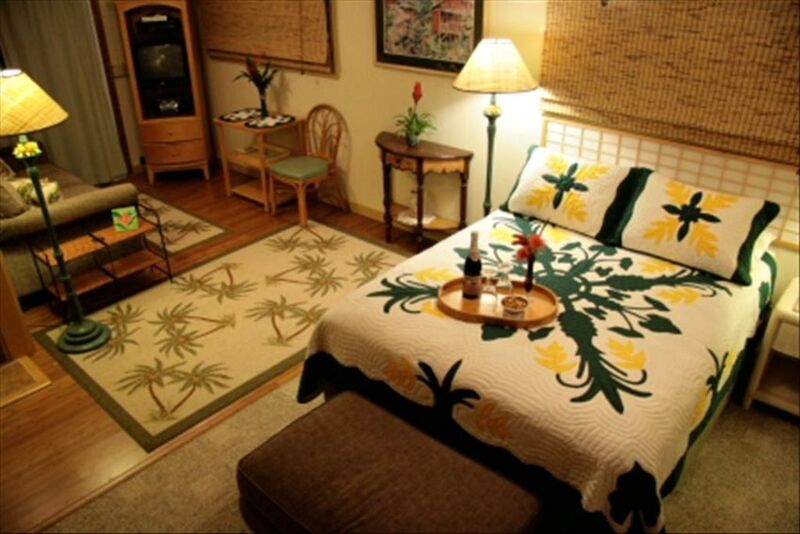 Just minutes from Old Koloa Town is this Plantation Style Studio and Courtyard. The Property is Located in a Rural Residential Area with a Private Garden Setting Surrounded by Lush Tropical Foliage and the Sounds of the Birds Singing in the Trees. Your Room Welcomes You with an Array of Floral Arrangements and a Gift of Local Favorites. A Sampling of Kauai Coffee is yours each morning with a Generous Supply of Cream & Sugar & Asstd. Teas. Cooking may be done outside on the gas grill provided with a set of pots and pans in the pantry. If you are not in the mood to prepare your food, there are many Wonderful Restaurants & Eateries in the area to choose from. Seating for Dining is available outside on the Picnic Table or Lanai as well as inside the studio. Beach Gear includes Towels & Chairs, Umbrellas & Sand Mats, and a Personal Sized Cooler. If you Prefer to Escape the Busy Resort Atmosphere and Experience Real Kauai Living then ' Aloha Kauai Courtyard ' is the Place to Be. This Home is also Owner Occupied and it's Studio is 400 Sq.Feet and can Accommodate up to Two Guests with a Private Entrance and Bath. Everyone Loves the Walk-In Shower with it's Built In Seating Bench. Glass Block Tiles were Engraved with a Ginger Pattern to Keep with The Room's Plantation Style Theme. The Courtyard View through the Glass Doors Gives a True Sense of Bringing The Outdoors In. This is a Perfect Getaway for the Budget Minded Islander at Heart. Email the Owners Directly for Reservations. Permit # Z-IV-2015-25. Our Property is Located in a Residential Area 5 Minutes West of Old Koloa Town. You will be Immersed in a Privately Enclosed Garden Setting with a Gentle Touch of the Beach and the Sand at Your Feet. Guests will have access to a microwave. Private enclosed Courtyard area with Picnic Table and Overhead Umbrella. Pleasent, modern, very clean private studio with a serene courtyard in a quiet neighborhood. Darryl and Julie are wonderful hosts. Appreciated the gifts they left in the unit. Comfortable bed, good wifi and shower. Great location, close to Kalaheo, Koloha and Poipu. Would definately request to stay again. Previous reviews mentioned Darryl's diesel truck starting in the morning. I did not find that to be an issue. As soon as he starts it he moves it to the street to warm up. Some mornings when I wanted to go sight seeing or hit the beach it would be time to get up. Other mornings I went back to sleep. After a couple of days on Kauai you won't even hear the roosters. Hint for restaurants: Kalaheo Coffee and Cafe. Wonderful and gracious hosts, terrific location (with car you are only 5 - 10ish minutes from awesome restaurants, shopping, shave ice and beach! ), relaxing studio with beautiful backyard garden. A+ . . . Perfect for a Couple . . . Everything is there for a Wonderful Stay! Julie & Darryl are wonderful hosts! From a welcome package to beach supplies to bath needs, everything was ready & in perfect condition for us. The apartment was spotless both inside & in the back court yard. We would certainly stay there again & would heartily recommend this property to anyone else! This place was a good location for visiting beaches and interesting sites along the south and west of Kauai. We liked being away from the congestion of hotels and condos. And we were pleased with the nearby restaurants, and shops. Julie andDarryl weregracious hosts. This is a wonderful place to stay. You are in a very quiet neighborhood that is close to the town of Koloa and the beaches of the area. The owners are very helpful and you are greeted with a basket of fruit and other goodies. I think we have stayed here 6 times and will certainly be back again. Many thanks to Julie and Darryl for a wonderful stay! They have taken care of everything you might need as a visitor far from home. The attention to guest comfort was clearly their main priority. The studio was so clean and wonderful with everything to make you feel right at home and relaxed. They are so gracious and even had a goodie bag with many terrific local treats for us! The property is just beautiful!!! We enjoyed eating meals on the lanai and enjoying the native plants and birds all around. We hope to return and visit our wonderful new friends Julie and Darryl again very soon! We really loved our time at their lovely courtyard! Rates - $ 95 Nt. Includes Mini Coffee Service & Gift of Local Favorites with 3 night minimum. Average Cleaning Fee $ 95. Invoicing through Homeaway/ VRBo. Only Cancellations made Prior to 30 Days Before Arrival will be Eligible for Full Refund. Refundable Security Deposit of $ 100.00 on all rentals. All Rental Fees Subject to 14.96% State Tax. Check In Time begins at 3 PM. County Use Permit # Z-IV-2015-25.